Experience the American Dream! This is it, Los Angeles and Las Vegas - The Land of Opportunity! Cruise down Hollywood Boulevard; and experience the glitz and glamour of America's 24 hour capital, the one and only Las Vegas. There are few cities that offer as much entertainment, excitement and diversity as do these two amazing destinations. The past and present come alive as you indulge yourself with memories that will last forever. Spend an evening exploring the Las Vegas Strip at night! 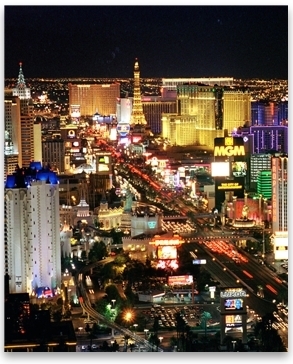 Spend time seeing the glitz and glam that makes Vegas a world class attraction! Experience the spectacular water fountains and visit the Conservatory of the Bellagio, the Pirate Ships at Treasure Island, the majesty of Paris and Venice – see erupting Volcanoes at the Mirage and The Rio Masquerade Show in the Sky! Extravagant shows, fine dining, and world class shopping, its all here. The Eiffel Tower Experience - This 540-foot tall half scale replica of the original Eiffel Tower creates a landmark in the sky for the Las Vegas strip. Ride to the observation deck on a glass elevator and look over the Las Vegas Strip from up above. The Roller Coaster at New York, New York - Ride on the thrill of your life on this 203-foot high roller coaster going at 67 miles per hours down 144-foot drops! The Las Vegas Natural History Museum - Travel through the past in this unique museum containing a dinosaur exhibit and a 3000 gallon-tank with live sharks! Investigate the sordid and secret history of Las Vegas. Visit the sites where murders, strange disappearances and mob activity occurred. Joined by tour guides, dressed in Pinstriped Suits and Fedoras, who weave "eerie" stories about Las Vegas' darkest secrets. The tales of Sin City's notorious gangster/casino builder Benjamin "Bugsy" Siegel, infamous mob enforcer Tony "The Ant" Spilotro, casino boss Frank "Lefty" Rosenthal, as well as celebrity deaths, suicides and many other strange and puzzling Nevada mysteries are colorful. This is something really different in Vegas…The Las Vegas Mob provides a spine tingling look into the dark and mysterious side of the Neon City! Leaving Vegas, we travel west through 270 miles of desert, but the Mojave is anything but what you might imagine a desert to be, flat and featureless. The Mojave Desert stretches from Arizona, westward across the Colorado River to the wedge-shaped Antelope Valley in Los Angeles County. Los Angeles (LA) offers everything from beach life, to Hollywood fame to great eateries, live music venues and theme parks. And, you just can’t beat the weather! It’s a great location for the adventures of the American Dream. Visit Mulholland Drive, Hollywood Blvd, the Hollywood Walk of Fame, Hollywood Bowl, Mann Chinese Theater, Kodak Theatre, Sunset Strip, Rodeo Drive in Beverly Hills, Santa Monica Pier and 3rd Street Promenade. Shop at the Beverly Center, a world famous mall and shopper’s paradise. You can find all the famous brands of the world here. A stop at the World Famous Farmer's market & Grove is the place to find out everything about the history and culture of Los Angeles. Anyone who watches television has seen images of the LAPD Academy, and its worth the time to visit. 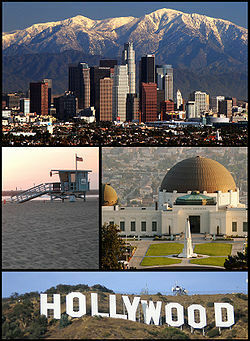 As is the Guggenheim Museum, La Brea Tar Pits and the famed Muscle Beach at Venice. Experience the opportunity to travel around the diverse attractions in L.A. Witness the glamour and decadence of Hollywood in breathtaking sightseeing tour to more than 40 star residences in Beverly Hills. Spend the day at one of the popular theme based amusement parks such as Disney Land, Knott’s Berry Farm, Pacific Park, Magic Mountain or Universal Studios. These are places which will make you realize why Los Angeles is truly the city of angels.